Sue McLilly buzzes through the hallways that wrap around the building on the corner of Dupont Ave. N and N 4th Ave. She sits on a two-wheel blue motorscooter with a basket to carry her purse, room keys and her favorite jazz albums. “I am a Bentley, Not a Cadillac” says a sign on the front of her blue scooter. What her scooter doesn’t say is that McLilly, after moving to Minneapolis from Texas in 1962, made a career as a stripper at the Gay 90’s, before it became a gay bar. She says a neighbor boy, nicknamed “Skipper,” who would later become globally known as Prince, babysat her daughter. She fed singer Tina Turner fried chicken, candied yams and black-eyed peas when she performed in Minneapolis. “She ate like she was on the electric chair,” McLilly said. McLilly had three strokes beginning in 1975, which required her to move into an assisted-living facility. That’s when she entered the public housing system. 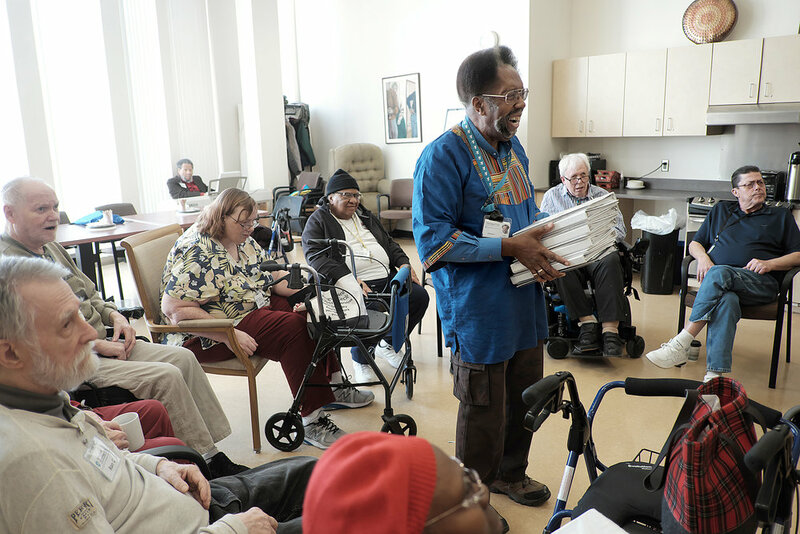 The Cora McCorvey Health & Wellness Center, owned by the Minneapolis Public Housing Authority (MPHA), claims to be the first and only community center of its kind across the nation to provide low-income housing and holistic services for seniors in one place. Feeney Manor, attached to the wellness center, provides 100 percent assisted-living, low-income housing for seniors, including those with dementia and Alzheimer's. Feeney Manor is one of 12 senior-only high-rises in the public housing system in Minneapolis. Across the entire MPHA portfolio, seniors make up 37% of residents. Currently, 538 “elderly” people are on the MPHA’s waiting list for housing. Jeff Horwich, director of policy and external affairs for the MPHA, says the elderly waiting list moves faster than the family list and that it typically takes six months, sometimes less, for a senior to receive public housing. Sue McLilly is one of the lucky ones. 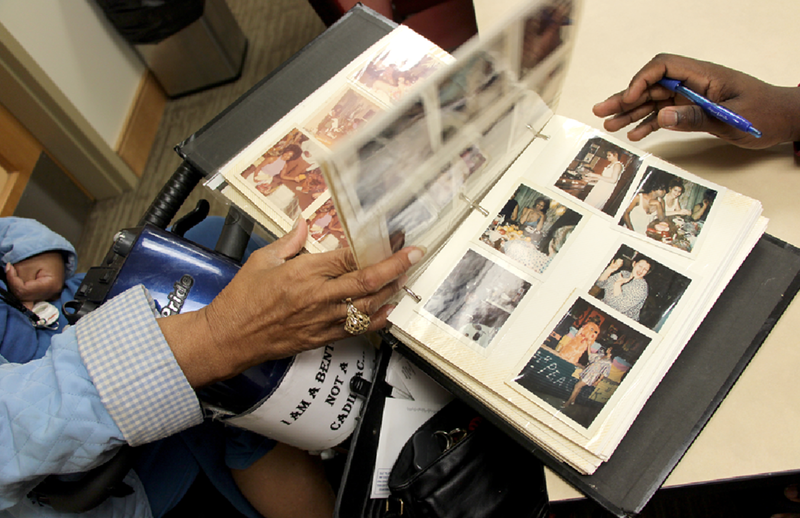 After her first stroke, she moved into Heritage Commons, a public housing high rise building across the street from the Cora McCorvey Center and Feeney Manor. Heritage Commons is only 30% assisted living, and residents like McLilly are able to live almost entirely independently. Residents of all of MPHA’s senior high rises pay 30% of their monthly income for rent. Marci Holley, a marketing specialist for MPHA, says places like Feeney Manor allow seniors to live in community. Before places like Feeney existed, seniors who needed assisted living had to move from public housing to state-funded nursing homes, which often crowd residents into rooms with several people and move them outside of their neighborhoods. “It feels like giving them their dignity and their life back,” Holley said. McLilly enjoys exercising at the senior-designated YMCA in the Cora McCorvey Center. She also spends six hours at Open Circle Adult Day, a weekday program run by Minneapolis-based Augustana Care that provides programming for seniors. Just like public housing, there’s a waiting list for Adult Day, too. Heritage Commons, where McLilly lived, opened in 2006, making it only five years older than the Cora McCorvey Center, which opened in 2011. The two neighboring buildings are the newest public housing units in Minneapolis, pending a groundbreaking next spring. Although both Heritage Commons and the center look new and clean, Horwich says MPHA desperately needs funds to repair the 6,000 units it has now. The repairs alone have an estimated cost of $130 million. That’s nothing compared to the costs of constructing new buildings. “We could build 20 more Feeney Manors and they’d be full the day they opened the doors,” Holley said. McLilly, now at Feeney Manor, is comfortable in her new place. At every meal, she dines on her favorite meal: Great Value oatmeal with butter and sugar while listening to the symphonies of jazz artists Jimmy Smith, Jimmy McGriff, Hank Crawford and Charlie Parker. She says if anybody doesn’t like it, they can leave. McLilly is comfortable where she is. She might never leave public housing, but she’s planning on walking again for the first time in 42 years.